Eastern junior Noah Browning competes in the 800m run at the Rocky Brands Invitational on March 31 in Nelsonville, Ohio. SOUTH WEBSTER, Ohio — A trio of golds. 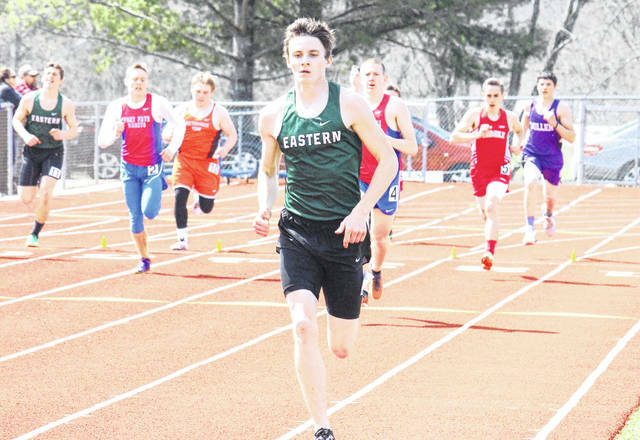 The Eastern track and field team finished first in three events at the South Webster Invitational on Saturday in Scioto County, leading the Lady Eagles to a second place finish and the EHS boys team to a sixth place mark. The girls team title was won by Wheelersburg with a score of 182. The Lady Eagles’ runner-up score was 106.5, while Peebles claimed third with a total of 90. The hosts were fourth with 41, followed by Oak Hill (39.5), North Adams (37), Chesapeake (36), Minford (27), Clay (23), Wellston (16) and Green (13). The Eastern ‘B’ team and Pike Eastern rounded out the team rankings with five points apiece. Eastern was victorious in the first event on the track, as the 4x800m relay team of Ally Durst, Jessica Cook, Ashton Guthrie and Rhiannon Morris was set the pace at 10:51.77. The Lady Eagles were third in the other three relays, with the team of Kylie Tolliver, Jaymie Basham, Morgain Little and Rylee Haggy running the 4x100m in 56.17, the quartet of Haggy, Basham, Jenna Chadwell and Alisa Ord running the 4x200m in 2:01.97, and the squad of Cook, Guthrie, Chadwell and Ord running the 4x400m in 4:46.53. Ally Durst was responsible for the Lady Eagles’ only individual gold, as she set a pace of 12:52.61 in the 3200m run. Layna Catlett picked up a pair of runner-up finishes for Eastern, posting a 29-3.5 in the shot put and a 104-2 in the discus throw. Cook had the Lady Eagles’ other runner-up finish, as she ran the 1600m in 6:03.86. Kaitlyn Hawk placed third in the 3200m with a time of 14:00 for EHS, Whitney Durst was fourth in the 1600m with a time of 6:17.99, Chadwell was fourth in the 400m dash with a time of 1:10.94, Katlin Fick was fourth in 100m hurdles at a pace of 18.62, while Avary Mugrage was fourth in the shot put at 26-11.5. Finishing fifth in the shot put for EHS was Morgain Little with a distance of 26-5.75, while Kassie Casto was sixth in the high jump at 4-4, Morris was sixth in the 800m at 2:53.3, and Basham was sixth in the 100m dash at 14.39. Minford won the boys team title with a score of 133, a full 50 points ahead of second place Chesapeake. Wheelersburg was third with an 81, followed by Green with 66 and South Webster with 55. The Eagles’ sixth place score was 37, four ahead of North Adams and five ahead of Notre Dame. Oak Hill (25) placed ninth, Wellston (24) was 10th, while Peebles (21) took 11th and Pike Eastern (18) ended up in 12th. Minford ‘B’ was 13th with 13, while Clay rounded out the 14-team field with three. Tyler Davis earned the Eagles’ lone championship, winning the shot put with a distance of 41-6.5. Davis also picked up a runner-up finish, marking a distance of 120-1.5 in the discus throw. Noah Browning also claimed a runner-up for EHS, running the 800m in 2:09.32. Mason Dishong picked up a fourth place finish with a distance of 115-5.75 in the discus throw, as well as a fifth place mark at 32-7.5 in the shot put. Visit www.baumspage.com for complete results of the 2018 South Webster Invitational.